The Meprolight FT Bullseye combines reflex and iron sight designs. The new Meprolight FT Bullseye pistol sight is the next in a line of innovative firearm accessories produced by the increasingly popular optics and sights manufacturer. The new FT Bullseye combines the front and rear sights into a unique single pistol sight located on the rear of the pistol slide. The center bullseye will only highlight when the sight is in line with the shooter’s eye. 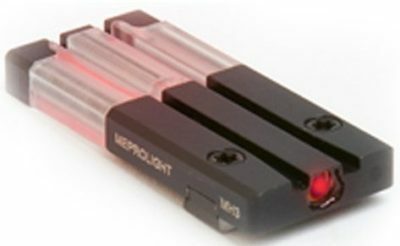 Meprolight is the optics and firearm sights manufacturer of the Mako Group distributors of weapon accessories. 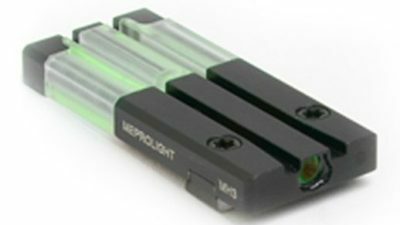 Meprolight has received positive attention at SHOT Show and other forums for a series of optics and sights with features. Meprolight is perhaps most known as a sights and optics provider for the Israeli Defense Forces (IDF), an award of considerable significance. Meprolight is the tactical sight subsidiary of the Mako Group. According to the press release on the FT Bullseye, Meprolight engineers sought to develop a pistol sight combining the advantages of a reflex optic while at the same time improving the sight alignment of traditional pistol iron sights. Reflex optics for pistols continue to become more popular, having significant sight alignment advantages over traditional 3-dot iron sight systems. The FT Bullseye combines fiber optic and tritium illumination. Using a combination of fiber optic and tritium illumination materials, the FT Bullseye will provide a bright sight picture during low-light or daylight conditions. This illumination design has the benefit of being “on” all the time, and does not require costly batteries to keep going. This unique design keeps the outer ring illuminated and visible for a quick reference point to gain sight alignment. However, the center circle only becomes visible when the shooter has properly aligned their eyes to the sight. By combining the sights in this manner, the sometimes hard to find front sight is no longer necessary. The FT Bullseye maintains a low profile. 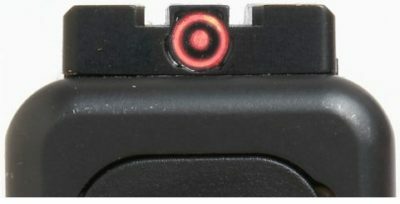 The Meprolight FT Bullseye design attempts to solve the bulkiness problem of reflex (red dot) optics on pistols, while at the same time, eliminating the forward front sight, which has constantly plagued pistol shooters attempting to align sights during stressful or low light conditions. In doing so, the FT Bullseye presents a rather unique sighting picture. One of our readers, Mark, pointed out this excellent video that shows the innovative Meprolight FT Bullseye pistol sight in action. The design feature where the illuminated bullseye goes in and out of sight is an excellent method for the shooter to know they are aligned with the sight and on target. MSRP: $199.05 to $225.65 depending on pistol. 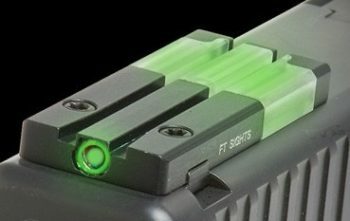 Meprolight FT Bullseye sights come in green and red illumination. The FT Bullseye red illumination is more subdued than its green counterpart. The arguments over pistol sights has been raging for decades, and more likely for over a century. About the only thing that all sides have agreed on is that handguns in general are shorter-range firearms most suited for personal protection. The reason for this is due to the shorter barrels and shorter sight radius on pistols. Shorter barrels on pistols translates to less impact on rifling to stabilize the bullet’s trajectory over distance. A shorter sight radius translates to greater negative impacts on bullet path from smaller inputs by the shooter. The traditional 3-dot, or similar iron sight system on pistols has been a great improvement over older post and notch sighting systems. However, in stressful or low-light shooting conditions, this alignment system has proven to be difficult for shooter’s to properly align. 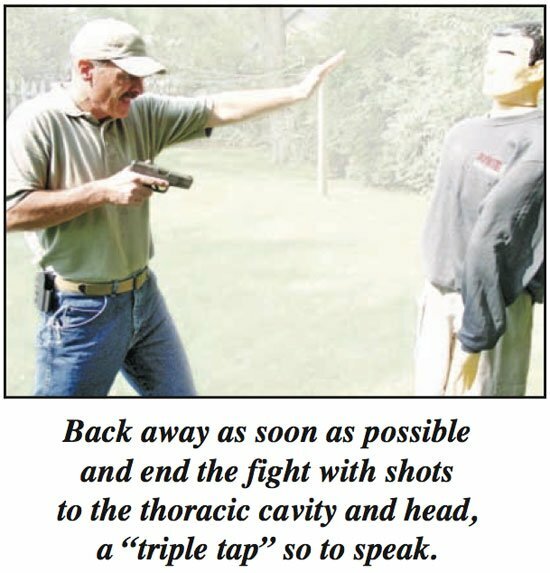 A tucked shooting stance is the best method for very close deadly force confrontations. This system requires the shooter to find the front sight and properly align that sight between two similar sights on the rear of the pistol. Considering the close-in nature of most defensive pistol shootings, the time required to align sights is often discarded by a shooter facing a high stress situation – thus reverting to simple point and shoot firing techniques. Point and shoot techniques can be very effective when engaging targets at very close distances. In fact, this method of shooting is highly preferred over sight alignment shooting for targets within 3 yards. 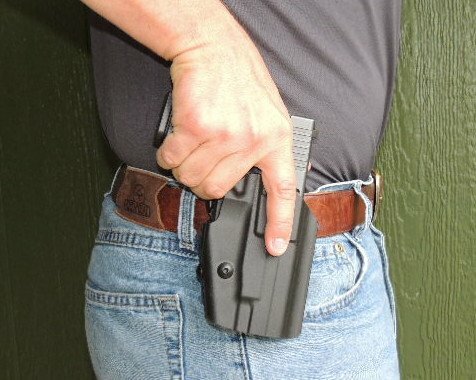 In those circumstances a close-in tuck shooting is most likely the best method to engage a deadly threat that could very likely advance on the shooter in under a second. Proper body position, arm extension, and sight alignment are necessary and legally required for accurate shots at distance. However, when the target gets beyond 3 yards shooters are best served with a two-handed shooting platform. Granted, in distances of 3-5 yards the shooter may simply be raising the pistol, locking out and shooting – point and shoot, rather than finding the front sight and making proper alignment. “Be sure of your target/threat, backstop, and beyond”. Whether you are in a law enforcement, or civilian defensive shooting, getting beyond 5 yards requires the shooter to establish some form of sight alignment. Having a bullet miss at greater distances, because of a failure to align sights, could result in both criminal and civil penalties to the shooter. The Meprolight FT Bullseye sight appears to provide the shooter a superior method of sight alignment, while avoiding the difficulties of front sight alignment found with traditional 3-dot systems. At the distances most handgun shootings occur, this could be a very beneficial feature and could reduce shot times from quicker alignment. 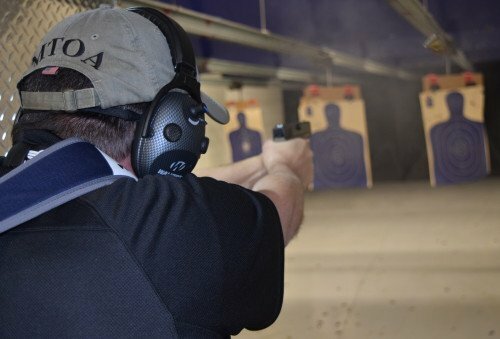 Mastering the draw is probably the most important technique to decrease times from threat identification to shooting. legal justification training and study for deadly force. “Meprolight’s engineers solved the issue of bulkiness with normal pistol red dot sights by combining fiber optics with tritium. The innovative FT Bullseye is a sleek, low profile single rear sight, which helps shooters to get on target, faster, in all lighting conditions. With this inventive design, there’s no need for a front sight; it’s all in the red-dot. When the dot is centered in the circle, you’re on target. It’s as simple as that! The low-profile design sets it apart from other micro sights and allows the shooter to pull the gun from the holster without having to worry about snagging a shirt or jacket on the sight. “It’s a real breakthrough in sight design”, ” I’ve never seen anything like it. You acquire the target quickly”, are comments frequently heard when experienced shooters use it for the first time. The combination of fiber optics and tritium make it effective under any shooting condition. Day or night, you’re good to go. The video below shows the FT Bullseye on and off target so you can get a clear idea of the sight picture.